"OSPREY COTTAGE" Downtown Eustis fun! 10years +++track record! Enjoy downtown Eustis & scenic boardwalk along Lake Eustis. Walk or bicycle to all the fun downtown events, festivals & restaurants. We have over 10 years of positive reviews and offering of a great rental experience to travelers via the VRBO/Homeaway program! Enjoy Lake Eustis Boardwalk -pretty drive or bicycle ride along Lake Eustis! Great home/location for Traveling Nurses or other business professionals wanting easy/close commute to Waterman Hospital! 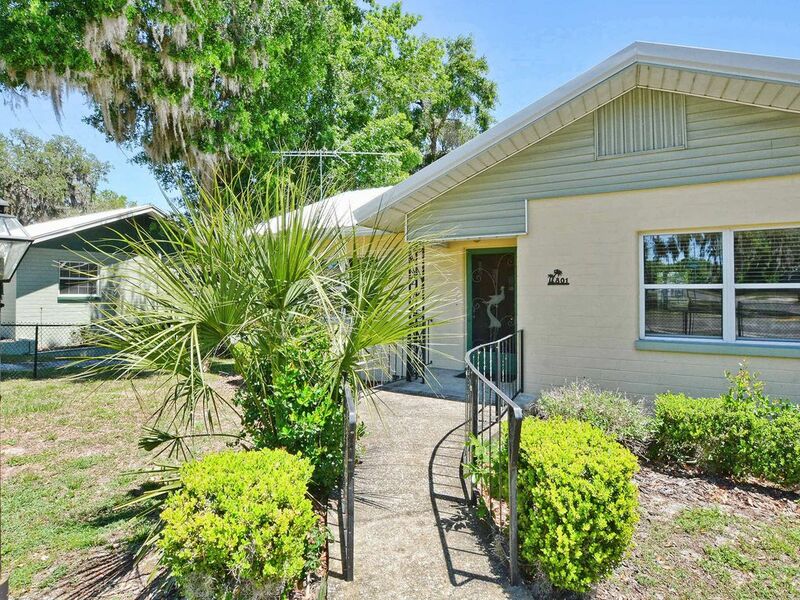 Our 2 bedroom, 1 bath home with extra large Florida room and adorable kitchen is located 2 blocks from Lake Eustis and downtown Eustis! Directly on a small new lake yet to be named! New kitchen and new furniture! Fresh & updated but kept the charm of the past! Private fenced property with electric gate make this downtown property unique. Small home and large yard and great view! The home's immediate back yard is fenced within the overall property's fencing - to keep your 'Fido' safe! Our home is well cared for, exceptionally clean and a wonderful opportunity for someone that wants to winter in Sunny Florida in the heart of boating/fishing country AND have a nice & reasonably priced home to rent. Driveway was designed for trucks with trailers (BOATS!!!) to come and go – park – and turn around with ease. No HOAs or concerns if you are traveling with extra vehicles/trailers! Want to see more pictures? Send us an email and we'll be glad to send you more photos! Any questions? Please just ask! We're just 'regular folks' like yourself! Keywords: House, Boating, Great City Location, Home with CHARACTER, charm, updates. Tim & Terry Ross. This home was Terry's parents 'winter/snowbird' home and has been a fun destination for the family to get out of the cold Ohio winters! Located close to the Harris Chain of Lakes -great for boating --- nice walk and boardwalk of Lake Eustis, etc! PLEASE WRITE OR CALL. We'd be happy to help you have a warm and sunny winter! Great location downtown Eustis! Close to lake and the heart of Eustis' shopping & restaurants. Enjoy the boardwalk! Walk or bike around to enjoy the quaint city life of Eustis. OR--minutes from many golf courses and boating ramps!!! Located in central Florida, one can easily get to either coast in a little over an hour! Extremely clean & well-kept small cottage with a great location. Large GATED yard/property, fabulous driveway for larger vehicles, and beautiful lake in back yard. Reasonable vacation get-away to enjoy Central Florida or drive to Disney or either coast in under an hour! Downtown Eustis. Walk to Lake Eustis' boardwalk 2 blocks away, walk to restaurants & shops! Great location! Small lake in back of property. Land-locked & always with water. Beautiful scenery.....eagles, hawks, herons! Enjoy private covered patio to watch lake and nature! Lake view. Special/direct access to City of Eustis park. Lots of good and not so. We enjoyed our stay. Everything worked, although having to clean the screens in the drains every day was annoying. Beds very comfortable. Climbing the back stairs was tough on my husband and getting to the front door was a chore, but we managed. Fenced yard was great for our dog. I've been renting from Terry & Tim for years. Why? I know the house will be clean, well furnished, comfortable. Love sitting in sun room, watching the sun rise over the back pond, set over Lake Eustis,b2 blocks away, visible out front window. convenient to local attractions. The house was well supplied, clean and safe. The owners were a joy to talk to and a good source of information. Great experience! Repeated visitor -time & time again! We regularly stay at this cottage. Home has everything you'd possibly need - very clean - and the hosts are great with communications etc. Plenty of room for my truck & boat --- close to boat ramp and Harris Chain of Lakes. We come here about three times a year for fishing and love the home, downtown location to walk to restaurants and the ability to have room for truck & fishing boat, etc. Terry is great to work with too which just simplifies the whole experience. Minutes from Tavares, Mount Dora & all the local festivals and events! Rates are subject to change unless reservation has been confirmed.